Everyone who’s familiar with online marketing knows that they should be using search engine optimization. You know that it’s important if your want their business to succeed in the digital space. But why is that? How exactly does SEO help your business? This post will help you understand the major benefits of SEO so that you get an idea of how important it really is for your business. The following are 15 major benefits of SEO that you can enjoy if you employ the right tactics. One of the most obvious benefits of SEO is that it increases your website’s visibility in the search engines by improving your rankings. Since SEO involves optimizing your on-site content with relevant keywords that get a lot of searches, it improves your ranks in the search result pages for those keywords. This makes your website more visible to searchers, which can further yield its own benefits. According to a case study by Pronto Marketing, advanced SEO helped improve their clients’ rankings by 25 positions on average, over the course of nine months. Another major benefit is something that I myself have experienced. SEO, when done right, can significantly boost your organic traffic. As mentioned earlier, it increases your visibility in search results so that increases your chances of driving more people to your site. Between 2016 and 2018, I managed to get a 12 times increase in organic traffic to my website. In 2017, there was a 275% year over year increase in the number of users. In 2018, there was a 364% year over year increase in the number of users. Read the full case study on how I enjoyed the various benefits of SEO. But I’m not the only one who has experienced traffic growth through SEO. Siege Media, for instance, went from zero visitors to 100,000 visitors within a year of implementing an effective SEO strategy. And Peep Laja attracted more than 40,000 visitors to his blog during the first month of its launch through tactical SEO. To top it all off, all of this traffic isn’t just any traffic. It is traffic made up of an interested and highly relevant audience. They came to your website because they were actively searching for something. And your website was among the most prominent results relevant to their search. So they’re not just visiting your website for the sake of it. They’re there because they’re looking for something. Whether they’re looking for information or for products to buy, there’s a good chance they will find it on your site because of your advanced SEO efforts. One of the biggest benefits of SEO is that it enhances the user experience and helps you leave a lasting impression on the right audience. As mentioned in the previous point, SEO connects you with people who were searching for information relevant to your products or content. Since your website contains information that’s relevant to what they were looking for, it’s bound to have a positive impact on their experience. Besides this, SEO involves other tactics to enhance user experience such as developing a layout that’s easy to navigate, optimizing page load speed, and using a mobile-friendly configuration. All of this contributes to enhancing the experience of people who visit your site, which will have its own positive benefits. For instance, it will lead to higher engagement rates on your site and that will further boost your rankings. An enhanced user experience for a highly relevant audience can only mean one thing. Your visitors will be spending more time on your site. Since it’s easy to navigate and you have the kind of information they’re looking for, they are likely to engage with your content more thoroughly. This significantly improves your time-on-site, which translates to higher engagement rate. More visibility and relevance in search results will also yield better click-through rates – another major benefit of SEO. There’s evidence to suggest that the more prominent you are in search results, the more click-throughs you will get to your website. According to an Advanced Web Ranking analysis, the top position gets a significantly higher click-through rate on both desktop and mobile searches. It generated a CTR of 30.54% on desktop and 23.59% on mobile. The CTR drops gradually along with a drop in search position, suggesting that there is a correlation between higher search ranking and higher CTR. As discussed in the previous points, the benefits of SEO include attracting a highly relevant audience to your site and enhancing their experience. Since the traffic you are attracting is made up of people who are likely to be interested in your products, you also have a better chance of converting them. What this means is that you are attracting high-quality leads through your SEO efforts. And this improves your chances of driving conversions on your site. What’s great about all of these benefits of SEO is that they are somehow interconnected. One benefit will result in a different benefit and so on. So even in the aspect of sales, SEO improves your performance because it helps you attract relevant visitors and quality leads. And that’s not just supposition; there are plenty of case studies proving how SEO drives better sales. Let’s take a look at the example of Pinocchio’s Italian Eatery located in Brighton, Colorado. The restaurant had never worked with an SEO expert before and their website wasn’t even mobile-friendly. With the help of an SEO team, they launched a mobile-friendly site with an optimized layout that would simplify user interactions. The restaurant reported a 16.7% increase in sales following this. An even more impressive example is that of SendOwl, which focused on creating quality content that’s optimized for search engines. They managed to drive 40% of their signups from SEO over the next six months. Besides these two, let’s take a look at another case study that clearly demonstrates some of these major benefits of SEO. Fire&Spark helped their client, Goat.com optimize their site for SEO. They resolved technical issues on the site to improve crawlability. They also changed the site architecture and reorganized the sitemap. In addition, the team helped the client identify high-value long-tail keywords that their customers were using. Using this information, they optimized the product copy throughout the site. After all of these improvements, Goat.com saw an 87% increase in organic traffic within six months. Their sales from organic traffic also increased tenfold over the next two years. Search ads are much more prominent in search result pages. So the common assumption is that they will get more clicks than organic search results. While these ads do have some impact on a website’s traffic and click-through rate, people still prefer to click on organic search results. And the top organic search results tend to get more clicks than PPC ads. That’s another way in which you can enjoy the benefits of SEO. 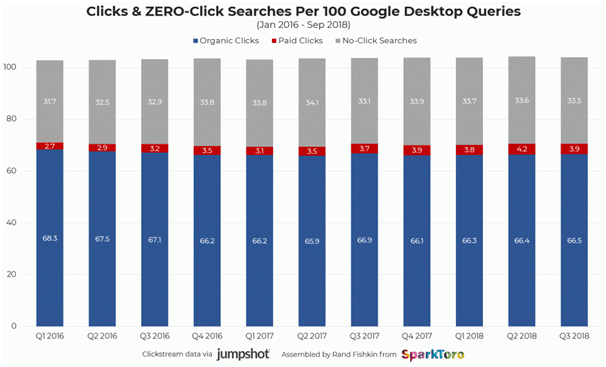 According to SparkToro, a lot of searches ended up with zero clicks. But among the clicks that occurred, most of them went for the organic search results. On desktop and laptop devices, around 66% of clicks typically went to organic results in 2018. Paid clicks only accounted for around 3% of the clicks. One of the biggest benefits of SEO is that it helps you cut costs. Once you’ve made an initial investment, you won’t have to pay ongoing fees for the organic traffic you are attracting. This is very different from PPC, which involves ongoing expenses as you will have to pay for every click to your ad. In fact, PPC ads on Google will cost you about $1 to $2 on average for every click, according to WordStream. But with SEO, you won’t have to pay for every click and every visitor you drive to your site. You just make an initial investment in terms of funds and efforts but incur no ongoing cost. So this significantly reduces your cost per acquisition. Among the most notable benefits of SEO is the fact that it yields long-term results. As mentioned in the previous point, you make an initial investment in terms of funds, time, and effort. After that, you will get to enjoy the long-term benefits without the need to make additional investments. SEO takes about 6-12 months to really move up in organic rankings. But once you get there, it’s difficult to move back down unless you make major mistakes or your competitors are doubling down on their efforts. Except for constant rank tracking and monitoring, you wouldn’t have to put in much additional effort to keep enjoying these benefits of SEO. This is a major difference compared to PPC, which delivers quick, short-term results. In this case, your traffic and sales will dwindle the moment you stop paying for your ads unless you invest in SEO as well. SEO is something that every marketer finds important, which means that your competitors are also using it. 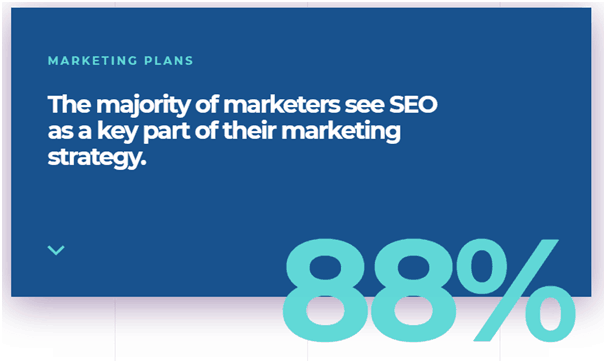 In fact, 88% of marketers in a Zazzle Media survey consider SEO as a key part of their marketing strategy. What this means is that adopting an effective SEO strategy helps you keep up with the competition. So even if it’s too challenging to get ahead of your competitors, at least you’re not lagging behind. In other words, SEO helps you bridge the gap between you and your competitors. One of the top benefits of SEO is that you can measure your efforts. With Google Analytics and a host of other analytics tools, you can measure your traffic, pageviews, and conversions. You can even measure the source of your conversions and the source of your traffic. So you’ll have a clearer idea of which keywords, channels, and efforts are most valuable for you. This is important because you’ll have a better understanding of where to focus your efforts and investments. You might find this difficult to believe but SEO also impacts your PR. Although the two may seem like entirely different aspects of marketing, they are somehow interrelated. Not sure how this can happen? Let me explain. One of the most popular strategies in SEO is earning links from reputable publications and sites with high Domain Authority. That’s because Google considers your link profile when ranking your site in search results. So we have stressed the importance of guest posting and getting mentions from websites that are relevant and prominent in your niche. In PR, the objective is to get as many people to learn about your business as possible. This means that a major publication or an influential figure talking about your business can yield tons of PR points. So, while you work to get backlinks from major publications for your SEO, you could also achieve some PR goals in the process. Another one of the major benefits of SEO is that it’s not a stand-alone strategy. It integrates with your other online marketing efforts. Which means you can align them with one another. Your content marketing, web design, and social media marketing efforts all influence SEO somehow. So if you know how to properly align all these efforts, it significantly reduces your time, effort, and costs. You won’t have to spend double on something that serves two purposes. For example, content marketing involves producing quality content, which is also something that is required for SEO. Come up with content ideas based on relevant and highly-searched keywords. And as you develop the content, make sure to optimize it with a target keyword. This way, you’ll be accomplishing two things – developing content for content marketing and optimizing your page for keywords. These are some of the major benefits of SEO that every business can enjoy. All of these benefits will eventually result in long-term exponential growth for your business and strengthen your credibility in the industry. As you can see, a lot of these benefits of SEO are somehow interrelated and you can enjoy two or more of them with a single effort. Know of any other benefits of SEO that I didn’t cover in this post? Please share your thoughts in the comments below.